The region of Montecucco includes part of the Grosseto area (Cinigiano, Castel del Piano, Arcidosso…) of the north-west side of Amiata mount. The first acknowledgement was given with ministerial decree the 30th of July 1998, and in September 2011 Montecucco was recognized DOCG (granted and controlled origin denomination), hence confirming the value and unique character of this wine. 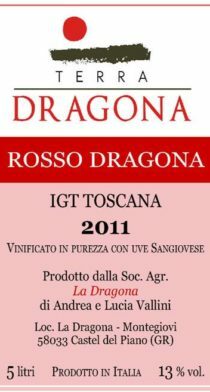 All Casa Dragona grapevines are apt to become Montecucco DOC e DOCG. It is sold bottled after a year of ripening in oak barrels and barriques and at least 4 months of refining in bottles. Pure Sangiovese wine is made at a quite low controlled temperature, with soft squeezing and short timeframe from harvesting to winemaking. 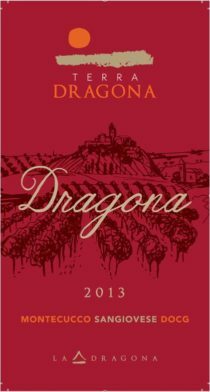 Scent: fruity and slightly flowery notes typical of Sangiovese, with vanilla, spices and toasted nuances. Flavor: intense and balanced for tannin and acidity. Warm, profound, persistent. Typical for Sangiovese. Scent: fresh, fruity and slightly flowery . Flavor: intense, pleasurable and harmonic. Pairing: white meats, roasted meats, fresh cheese.